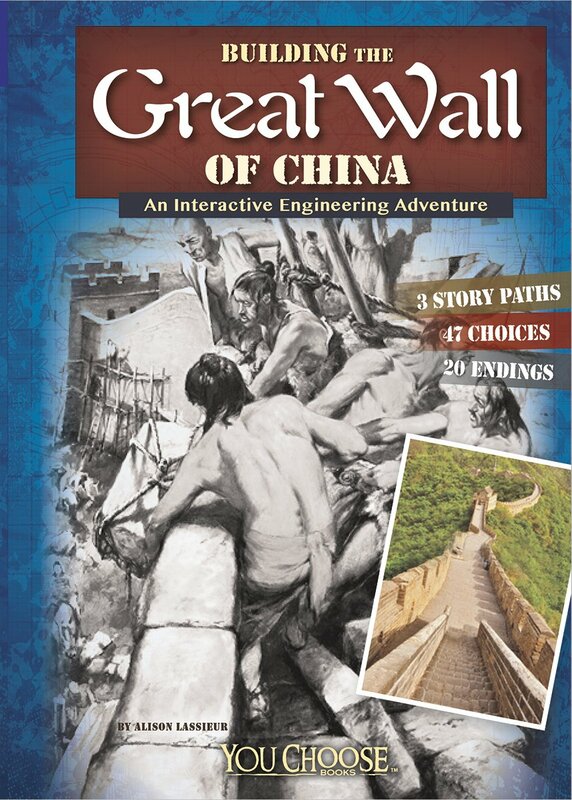 I really like these interactive books that let you decide what happens in the story. Every possibility is true and happened to someone during the planning and building of the Golden Gate Bridge. 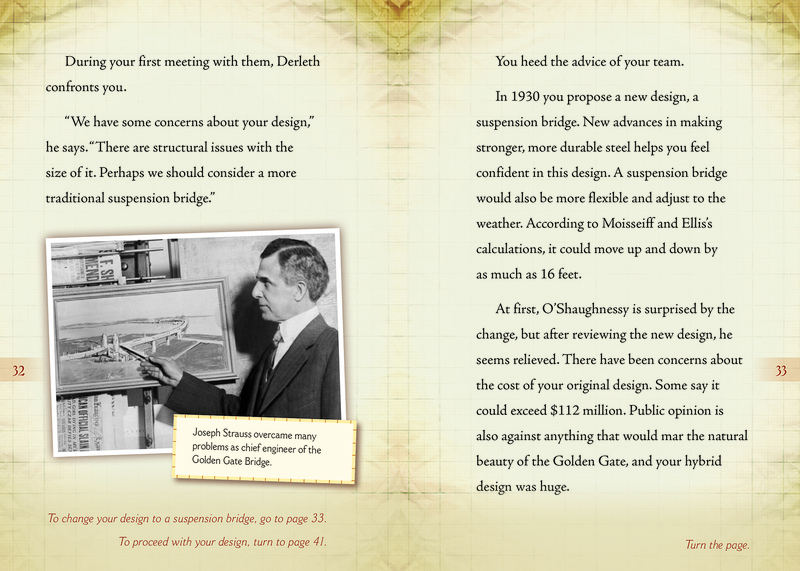 You can be engineer, John Strauss, who designs the bridge and must decide which of three design choices available in 1919 will work best: a cantilever bridge, a suspension bridge, or a cantilever-suspension hybrid bridge made up of parts of the former two types (pictures and description of each included); or a construction laborer (a catcher or a skywalker). I began with the engineer route . . . and failed. I fared better as a laborer, first as a catcher. I catch hot rivets (heated to 1900 degrees Fahrenheit), flung to me from above, which I catch in a funnel shaped cup and hand, using tongs, to the next guy, who uses it to connect two beams. Missing even one red-hot rivet can be catastrophic. Someone could get hurt, especially someone—or thing—in the water below. Objects also tend to fall from men working higher up, mainly due to wind gusts knocking tin cups out of hands and safety helmets off heads. Looking up to see what is falling your way can get you badly hurt, if not killed. I looked up, ending my short career. Safety measures, the few used, are an interesting part of the story. Finally, I tried my hand at the last job option: a skywalker spinning cables. Standing 756 feet up at the top of the bridge, men—sorry, no women—skywalkers wait for three wheels, carrying coils of wire, to race down a guide rope. Once the wheels pass, they grab the strands of wire, gather, tighten, and keep them from twisting around one another. The supporting cables on the Golden Gate Bridge are made of hundreds of thousands of wires. The job is dangerous thanks to the heavy fog that occurs so often in the Bay area. A cowbell hung from each wheel so the wheels could be heard when the fog was thick. What is cool about the You Choose Books is the amount of history readers will learn, often without realizing they are learning. Based on true stories from the building the Golden Gate Bridge, what you will face on each path actually happened to someone. 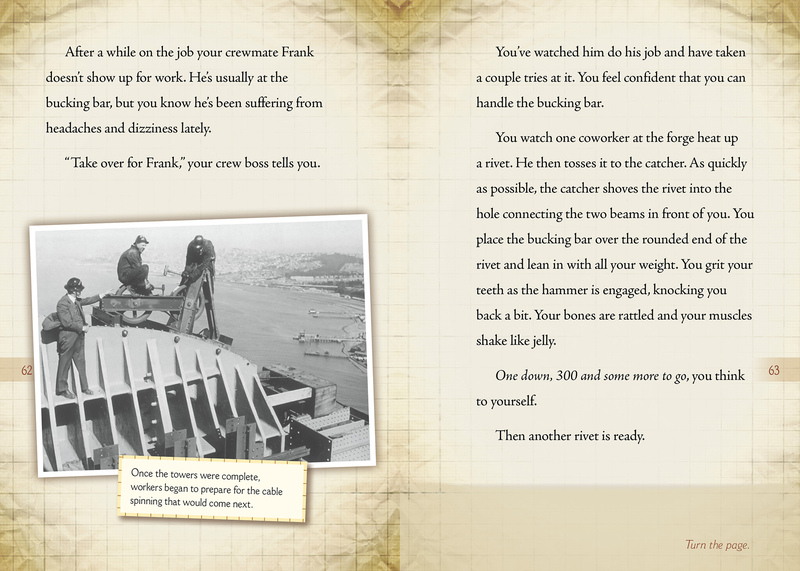 While trying to make decisions to build the bridge, stay employed, and alive, history becomes part of your story. You need to understand some part of the Golden Gate Bridge’s beginning—its history—to make your choices. I never could get excited about something that happened years before I was born—or even yesterday’s news. I knew nothing about building the Golden Gate Bridge it was just always there. Now, I know part of the history and so will kids who read these interesting stories. For this reason, the You Choose Books series are perfect as adjunct texts for teachers. And perfect for boys, who will love the action and the ability to wipe themselves off and try another path. Girls will, too, but if there is a book made for the minds of boys, the You Choose Books are those books. 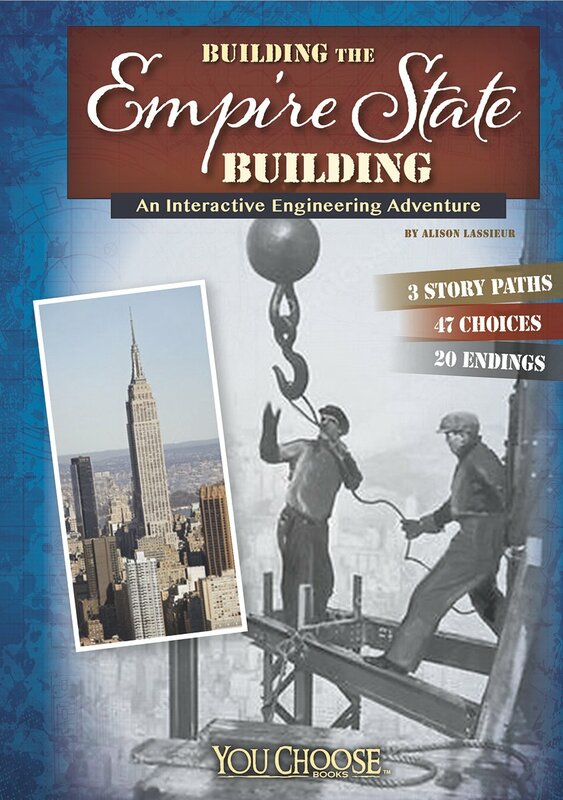 The Building of the Golden Gate Bridge has 2 story paths (engineer or laborer), 33 choices, and 9 possible story endings, as do all of the You Choose Books. There is also a Timeline beginning in 1872 when Charles Crooker proposed building a bridge over Golden Gate (and 61 before actual construction on the bridge began). 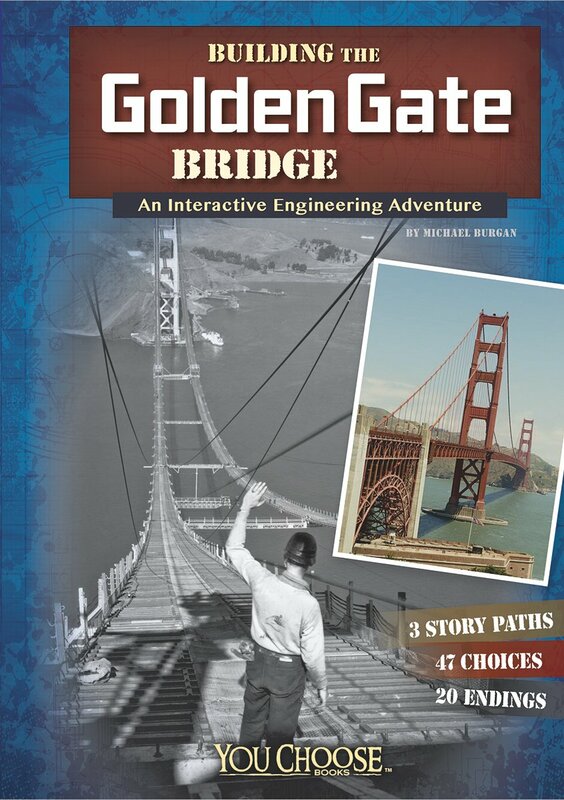 After reading and rereading each path and its nine different endings, it is all but impossible not to know something about the history of The Building of the Golden Gate Bridge. 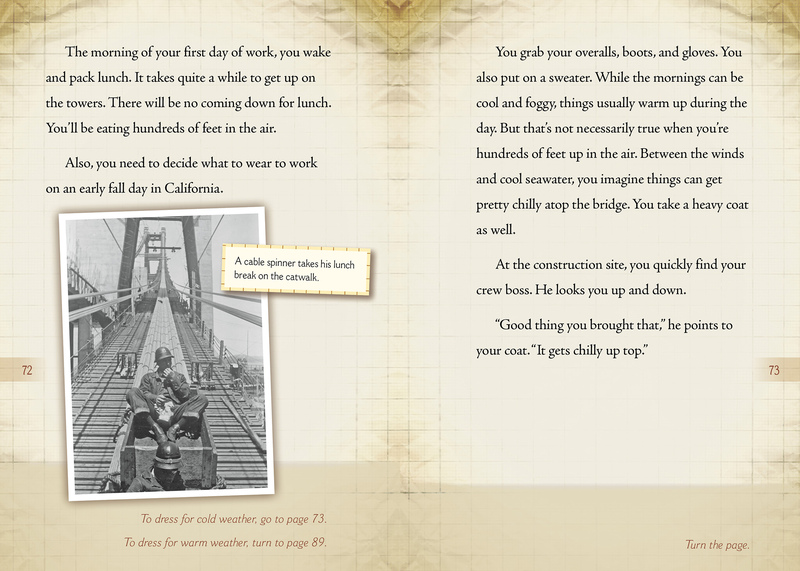 BUILDING THE GOLDEN GATE BRIDGE: AN INTERACTIVE ENGINEERING ADVENTURE (YOU CHOOSE BOOKS: ENGINEERING MARVELS). Text copyright © 2015 by Blake Hoena. Images copyright from various sources, as noted. Reproduced by permission of the publisher, Capstone Children’s Books, North Mankato, MN. Purchase Building the Golden Gate Bridge at Amazon —Book Depository— CapstonePub. Learn more about Building the Golden Gate Bridge HERE. I admire these non-tech interactive books. A great way to learn! There re a little addictive, too. I read every path and ending. It is a fun book. 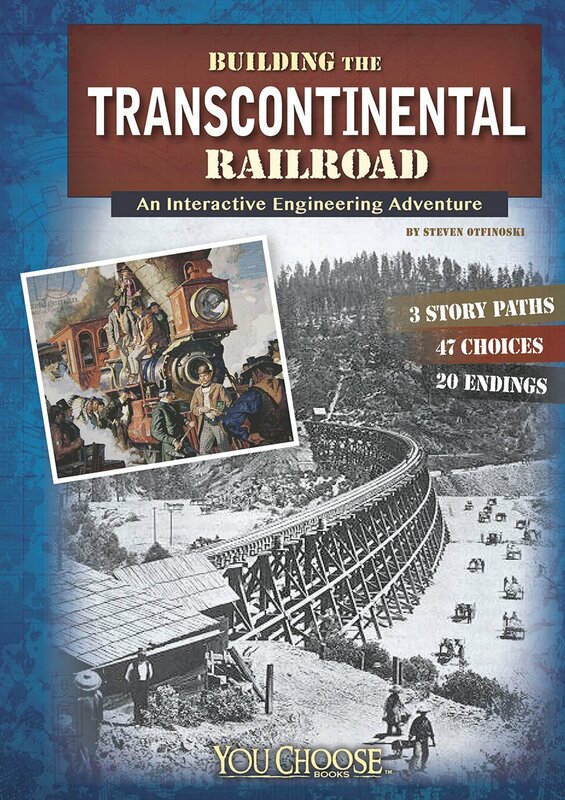 A Nonfiction Choose Your Own Adventure! I love this idea!